Private collection, Forte dei Marmi. This work is sold with a certificate of authenticity from the Fundación Pettoruti signed by Tomás Roberto Díaz Varela. Emilio Pettoruti's significance for the advancement of southern Latin American modernism cannot be overestimated. The artist's first solo exhibition in Buenos Aires in 1924, after an eleven-year sojourn in Europe, was an epic event, inciting both condemnation and accolades. Held at a crucial moment in the development of the Argentine avant-garde, Pettoruti's show coincided with the establishment of the radical cultural magazine Martín Fierro. In the October 9th issue of this journal, Argentine artist Alejandro Xul Solar, also recently returned home from Europe, said of Pettoruti, "The Buenos Aires public will shortly be able to admire, condemn or scorn his work, which other publics have supported in more than thirty exhibitions in France, Italy, Sweden and Germany; but all will recognize the great importance of this man, his art, a point of departure for our own artistic evolution. "(1) Solar's prediction was to be fulfilled; in the years following Pettoruti's return, Buenos Aires became one of the most active artistic centers for modernism in the Americas. In that pivotal exhibition, Pettoruti showed many canvases that illustrated his interest in the principles of Futurism and Cubism. In Testa di donna, Pettoruti depicts the head and partial torso of an anonymous woman rendered in a Cubist idiom. Pettoruti was first exposed to Picasso's and Braque's revolutionary new movement through avant-garde magazines while living in Italy from 1913 to 1923. Testa di donna demonstrates the artist's grasp of the volumetric and perspectival manipulations seen in Cubist works. Broken into geometric shapes, the woman seems to merge with her surroundings. By collapsing space, Pettoruti denies that constant quest in Western art up until the advent of Cubism--the illusion of three dimensions on the two dimensional surface of the picture plane. Unlike Analytic Cubism, however, the donna maintains her form, not entirely dissolving into the background. 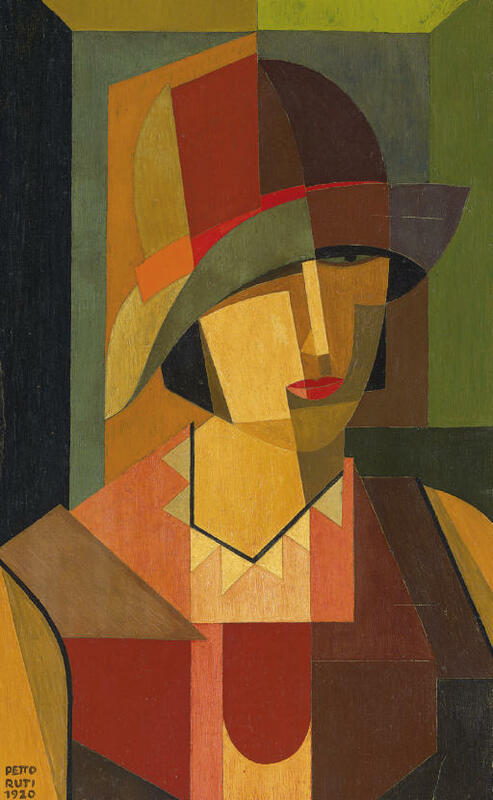 Her shoulders, neck, head and hat are still discernable from the walls of the room despite being reduced to rectangles, triangles and squares rendered in similar colors. Pettoruti's palette is brighter than one finds in early Cubist portraits traditionally painted in shades of brown, black and gray. While the later still-lifes of Synthetic Cubism often include patches of reds, blues and yellows, there is generally not the complete medley of pastel tones as seen here in Testa di donna. A supreme colorist, Pettoruti distinguished his work from that of the Parisian Cubist circle and inspired a new generation of Argentine modernists. 1) As reproduced in: Nelly Perazzo, "Reflections on Emilio Pettoruti and his Work," in E. J. Sullivan, et al., Pettoruti, Buenos Aires, Fundación Pettoruti, Asociación Amigos del Museo Nacional de Bellas Artes, la marca editora, 2004, p. 176.